Lear Siegler Incorporated (LSI) is a diverse American corporation established in 1962. Its products range from car seats and brakes to weapons control systems for military fighter planes. The company's more than $2 billion-a-year annual sales comes from three major areas: aerospace-technology, automotive parts, and industrial-commercial. The company, however, is basically anonymous, since its products are either unmarked or bear only the label “LSI”. But Lear Siegler, which went private in 1987, is an influential part of the manufacturing industry in the United States. Unlike Lear, LSI does not produce executive jets that bear the “Lear” name. During the late 1950s, and throughout the 1960s and 1970s, America (and Southern California in particular) was experiencing an unprecedented boom in aviation technology and aerospace research and development, based on a "space race" inaugurated by the launch of Sputnik, a simple but startling first in a long history of scientific and technological competition between the United States and the Soviet Union. In June 1955, seven months after the consolidation of the precursor Siegler Corporation business entities and relocation of corporate headquarters to a downtown Los Angeles address. Over the next decade and a half, Brooks, who became Siegler's first president, established a reputation for supervising numerous startling acquisitions, Hallamore Manufacturing Company, an electronics firm, became Siegler's first acquisition. During the 1960s, the company expanded rapidly. Lear Siegler Incorporated was created as a result of the 1961 merger between the Siegler Corporation (Los Angeles) and Lear Avionics Inc. (of Santa Monica, also known as Lear Inc.). Lear Inc. was an aerospace electronics firm. The merger was complete by 1962, and the new company was named Lear Siegler Incorporated. The deal, which cost Siegler five shares for each seven Lear shares, nearly doubled the company's sales - from $96.2 million in 1961 to $190.8 million by the end of 1962. John G. Brooks was founder, President and Chairman of Siegler; and William Lear was founder, President and Chairman at Lear. The merger was based on Brooks' plan of acquiring and growing successful but possibly unrelated operating companies (with resources and management in common) into one of the first conglomerates (with a focus on aerospace, defense and consumer markets) and Lear's goal of divesting his ownership interest in Lear to pursue development of his Learjet corporate aircraft (the first pure jet private aircraft) as well as other engineering innovations. The business climate was strongly influenced by the political undercurrent that accelerated when Sputnik was launched, and amplified when President John F. Kennedy set as a national goal putting an American astronaut on the Moon by the end of the decade of the 1960s. This goal, based on an unprecedented effort by the combined resources of the American aerospace industry, was achieved in 1969. In 1965, LSI (the “short” form of the company's name) acquired all assets of Hypro Engineering Inc (operated as the Hypro Division) in exchange for more than 120,000 common shares. In 1966, it purchased American Metal Products Corporation, an automobile seating and furniture parts manufacturer, and Home Furnace Company (which operated as a division of the company). In 1968, LSI purchased National Broach & Machine, a gear machine manufacturer. LSI acquired Cuckler Steel Span Company (operated as Cuckler Building Systems Division) in 1970. The purchase of the Haas Corporation (inaugurated the company's plastics division) and American Industrial Manufacturing Company, a manufacturer of thermo, plastic, and fiberglass safety helmets, represented LSI's entry into plastics manufacturing. By 1970, LSI had 56 divisions in 17 countries operating in six major business areas — commercial products, fabricated products, avionics, power equipment, systems and services, and real estate. Keys to the company's growth and performance were product diversification; balanced growth, where internal growth matches growth by acquisition; a favorable sales ratio between non-government and government business; a formalized, in-depth planning program; and emphasis on management development. Sales had skyrocketed from $6.5 million at its inception to over $600 million by the close of 1969. Government / Aerospace accounted for 65% of its volume. In its expansion, Lear Siegler had acquired Bangor Punta, which was an early conglomerate manufacturing Piper Aircraft, multiple brands of sailboats, including Ranger Yachts, Smith & Wesson firearms and other well-known brands. In the early 1970s, LSI's luck changed for the worse. In January 1971, following a business dinner in Detroit, John G. Brooks had a fatal stroke at the age of 58. He had personally presided over more than three dozen acquisitions of mismatched, marginally profitable businesses which took the company into many different areas. Robert Campion, then company Secretary, followed Brooks as Lear Siegler's president and chief executive officer. In 1971, the company, then a major subcontractor for the Lockheed L-1011 commercial jet programs, saw its earnings plunge when the project was suspended because of problems with the jet's engine supplier, Rolls-Royce. Delays in other government projects, steep start-up costs at a modular housing factory in Hawaii, and a strike at General Motors also damaged the company's profits. By the end of the year, Lear found itself involved in a major reorganization which involved consolidating five of its divisions and selling five others. CEO Robert Campion's low-key approach permitted the company to fade into relative obscurity. LSI leveraged its new expertise in controls, instruments and navigation systems into a steadily increasing share of government and general aviation contracts for research and development, as well as system delivery. Notable innovations since then include inertial guidance systems, "hands off" landing systems, the telemetry and navigational instrumentation for the Apollo Moon missions, and the flight controls for the Lockheed L-1011 commercial aircraft. In 1972, LSI manufactured the first video terminal — the 7700A. Because the new minicomputer systems required inexpensive operator consoles (compared to teletype printers), the terminals became a success. In 1973, LSI hired the new head of engineering, Jim Placak. He and his team created the ADM-1 terminal in late 1973. It set a new pricing low in the industry at $1,500. Its lower cost was primarily due to a unique single printed-circuit board design. The ADM-1 was followed by the ADM-2 in early 1974. It had expanded functionality and a detached keyboard. 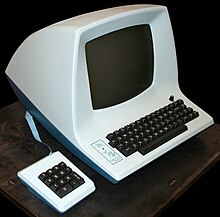 In 1976, LSI released ADM-3A, one of the earliest computer video terminals, with a new industry low single unit price of $995. With no fast low-cost printers available, the ADM-3 became the de facto standard. In late 1986, LSI was put into play by the investment banking firm, Drexel Burnham. That play led to the purchase of LSI by Forstman Little in early 1987. Subsequently, most of LSI's divisions were sold off leading to such independent companies as Safeflight, Smith and Wesson, Piper, Lear Siegler Seating and BFM Aerospace. The division that produced fly by wire systems and unmanned aircraft was purchased by British Aerospace, now part of BAE, the largest defense contractor in the world. In 1997, LSS Holdings, LLC acquired the operating assets of Lear Siegler, Inc. and its subsidiaries UNC Lear Siegler Services, Inc. and Burnside OTT Training Center, Inc.
LSI provided aircraft maintenance support services on F-5 aircraft under a contract with a Saudi Arabian government ministry, ending in 2000. Contested rent from Saudi Arabian landowners led to a 2004 judgement by the International Chamber of Commerce (ICC) in favor of the landowners. In addition, per URS Corp's 2004 form 10-K Report, Saudi Arabia issued $5.1 million in taxes for the years 1999 through 2002. ADM-3A, an early LSI terminal. ^ Browning, Randy (2016). "Ranger Yachts (USA)". sailboatdata.com. Retrieved 5 October 2016. Planning for Growth and Profit: The Success Story of Lear Siegler, Inc, Newcomen Society, 1970, ASIN B000K5P39I . Olson, Gordon L (1994), Fifty times around the sun: History of Lear-Siegler, Smiths Defense Systems North America, Public History Services, ASIN B0006QR4UW . Boesen, Victor (1971), They Said It Couldn't Be Done:: The Incredible Story of Bill Lear, Doubleday & Co .
Rashke, Richard L (1985), Stormy Genius: The Life of Aviation's Maverick Bill Lear, Houghton Mifflin, ISBN 0-395-35372-6 . This page was last edited on 28 February 2019, at 15:51 (UTC).